1840 - world's first stamp. Stamp Shows. Aloha, Bemvindo, Benvenuti, Benvenuto, Benvingut, Bienvenido, Bienvenue, Buenos Dias, Bula, G'Day, Salutatio, Selamat Datang, Shalom, Willkommen, Välkommen, Velkommen, Vítejte. + THE STAMP YELLOW PAGES DIRECTORY. and Worldwide Stamp Sites Now Listed ! Please support our advertisers. They make this website possible. DO YOU BUY NEW ISSUES? Don't be overcharged by Foreign Post Offices or their agents at your local Stamp Show. This Currency Exchange rate chart lists 28 stamp-issuing countries with fixed exchange rates or who use the US$. If you are a collector or dealer in worldwide postage stamps, revenue stamps, covers, postal history, postal stationery, postcards, cinderella stamps etc., and are looking for a stamp show close to where you live then this website is for you. STAMP SHOWS provides the dates, places,directions and latest information on hundreds of different stamp shows worldwide and is updated regularly. STAMP SHOWS covers all sizes of stamp shows from the small one-day dealer bourse to large International Stamp Expositions. 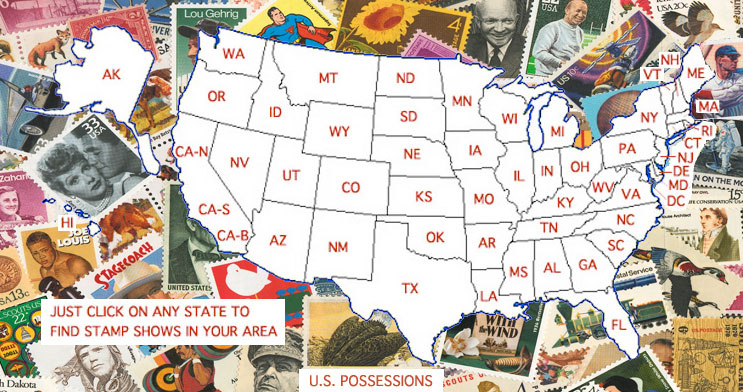 Just click on your state, area or country below to see all the stamp shows near where you live. Happy browsing. Stamp Shows from all over the world are being added as soon as information is received from the promoters. Your input is eagerly wanted, please click here to send your stamp show information. Promoters, please read this first. If you come across any errors or broken links, please click here to send the details so they can be corrected for the benefit of future viewers. Thank you. Current temperatures and times worldwide (outside U.S.A., the time is shown on a 24-hour clock) - after reloading this webpage. Stamp Show promoters, don't be left out, click here to e-mail your stamp show information. Not convinced ? Then please read this . STAMP YELLOW PAGES DIRECTORY ON THE INTERNET. 63 DIFFERENT CATEGORIES TO CHOOSE FROM ! Click here to e-mail comments about this website.